Without a doubt, many of us became negative toward ecumenical and inter-Lutheran efforts, due to what has been referred to as “least-common denominator ecumenism,” meaning false ecumenism based on mis-representation and a desire to further ecumenical relationships, regardless the cost to biblical and confessional positions. For this reason, some fail to see the value in our ongoing efforts to develop and strengthen ecumenical and inter-Lutheran relationships both here in North America and abroad. Some question the time, energy and expense of ecumenical and inter-Lutheran conversations, consultations and gatherings. Although the life, health and well-being of our congregations are always our primary focus, as NALC staff, we heed the instructions of our initial ecumenical statement and the NALC constitution initiating, organizing and participating in ecumenical and inter-Lutheran endeavors, as stated in the Initial Statement, “in accordance with our commitment to the Scriptures and the Lutheran Confessions.” The statement continues, “Our prayer is that the Holy Spirit will lead us into such ecumenical and inter-Lutheran endeavors in faithfulness to the Great Commission of our Lord…that all relationships should have as their goal the mission of Christ and his church, ‘that the world may believe…that the world may know” (John 17:21 ,23 ). You will be seeing press releases and information about three such NALC efforts that have as their aim, the developing of relationships in accordance with our commitment to the Scriptures and the Lutheran Confessions, but always to further mission in general and specifically our obedience to the Lord’s command to “Go, baptize, make disciples, teach…” (Matthew 28:19 ). While more information will be shared elsewhere, it seems worthwhile providing a brief glimpse into these recent activities as they fulfill our ecumenical and inter-Lutheran commitments. 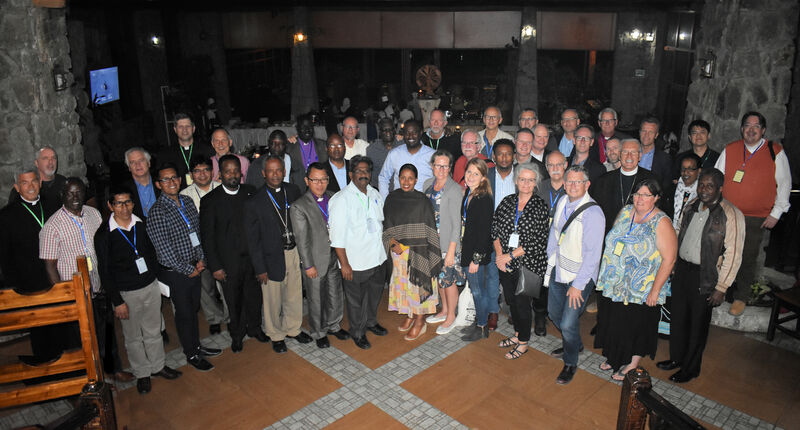 43 participants representing Lutheran bodies in 15 nations participated in the 2018 Global Confessional & Missional Lutheran Forum in Bishoftu, Ethiopia. Clearly, the work of the GCMLF is closely related to the goals and mission of the NALC and well worth our investment. The Bishoftu Letter to the Lutheran Churches was released Reformation Day, October 31, 2018. 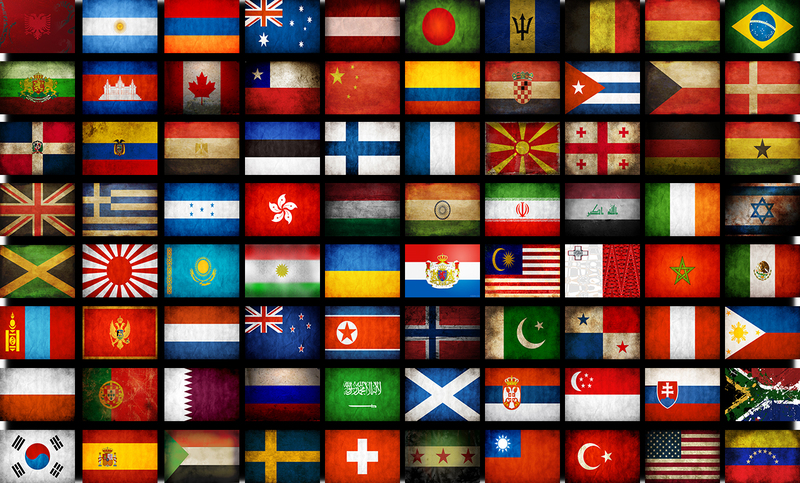 Translations into other languages will be released in due time. 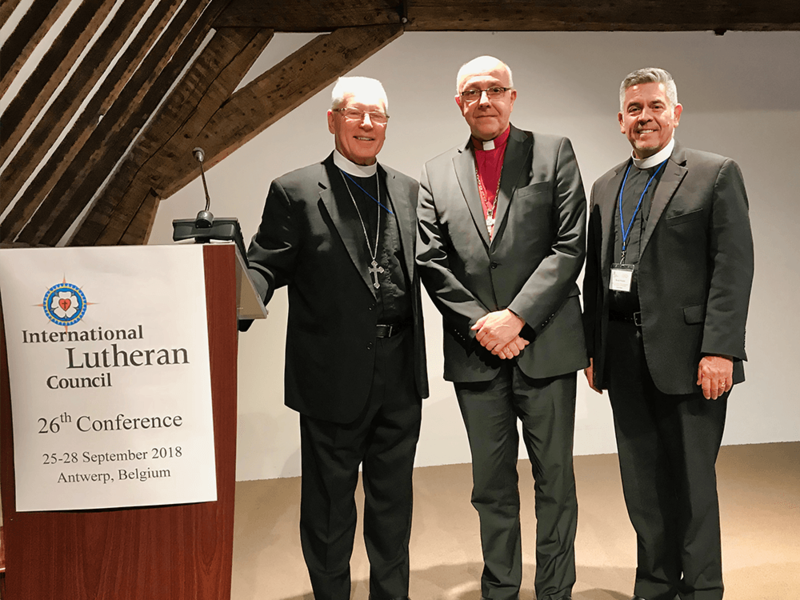 The International Lutheran Council’s (ILC) 26th Conference took place September 25-28 in Antwerp, Belgium. Bishop Bradosky and I were present as invited guests. 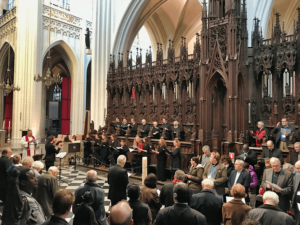 The conference focused on the theme, “Ecumenism and Ecclesiology.” Lectures and responses were offered on the theme, the days began and ended with Morning and Evening Prayer in the beautiful and historic churches of Antwerp, and we observed the commemoration of the first martyrs of the Lutheran Reformation. Two monks who had studied with Luther in Wittenberg, returning to their Augustinian monastery in Antwerp bringing the new Lutheran ideas to the “Low Countries,” until on July 1st, 1523, they were burned at the stake in Brussels, Belgium. What else happened during the conference? 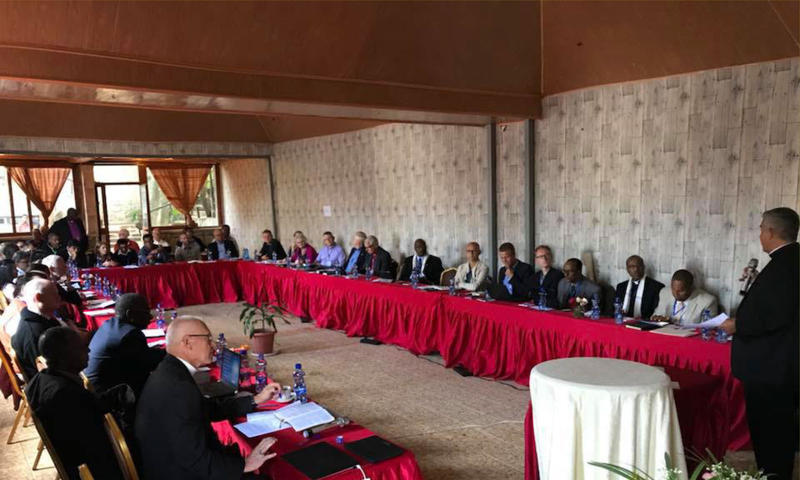 Among other things, a resolution was presented and passed in response to the Lutheran World Federation’s action discontinuing annual meetings with representatives of ILC, affirming the desire and willingness of the ILC to continue meeting for the sake of conversation, clarification and exchange of information. Also approved at the conference was a resolution indicating support for the proposed formation of a formal ecumenical dialogue between the ILC and the Roman Catholic Church’s Pontifical Council for the Promotion of Christian Unity. Informal conversations have taken place since June 2014, but this proposal will elevate this to the level of a bilateral dialogue. Evening Prayer with the International Lutheran Council in the Cathedral Church of Our Lady in Antwerp, Belgium. Celebrated at the conference was the reception of new members and official observers, largely as the result of the incorporation of the ILC as a council independent of the Lutheran Church-Missouri Synod and their change in bylaws allowing for associate memberships and observer status “with exception”—meaning church bodies, movements or individuals may join as official observers, taking exception to certain articles of the ILC constitution. 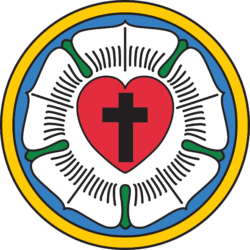 As a Lutheran body committed to the truth and authority of Holy Scripture and the Lutheran Confessions, it is a blessing and an opportunity for the NALC to be present and in conversation with like-minded Lutherans from around the world. NALC delegates meet with delegates of the United States Conference of Catholic Bishops in Chicago, October 2018. From L-R: Pastor David Wendel, Father Al Baca, Bishop John Bradosky, Pastor Mark Chavez, Bishop Joseph Bambera, Father Ronald Roberson. 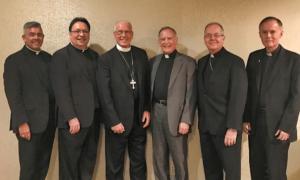 Finally, a meeting with representatives of the United States Conference of Catholic Bishops took place October 10, in Chicago, IL. Present from the USCCB were the Most Rev. Joseph Bambera, Bishop of Scranton and the chair of the USCCB Committee for Ecumenical and Interreligious Affairs; the Rev. Alfred Baca, executive director of the Secretariat of Ecumenical and Interreligious Affairs and the Rev. Ronald Roberson, CSP, Associate Director of the Secretariat for Ecumenical and Interreligious Affairs. Representing the NALC was Bishop John Bradosky, Pastor Mark Chavez, General Secretary, and myself. The resolution, approved unanimously at the recent 2018 NALC convocation in Denver, was well received by these representatives and stimulated considerable conversation regarding the NALC’s Life-to-Life Discipleship initiative, the Roman Catholic emphasis on “missionary discipleship,” begun by Pope John Paul II and most recently furthered by Pope Francis’ exhortation, “The Joy of the Gospel.” The Secretariat of Ecumenical and Interreligious Affairs gathered for their regular meeting after our consultation, and they shared that they would be bringing our resolution to the group as a whole. We are awaiting their response. At the least, it appears we will continue with this more significant annual meeting and conversation. A biannual consultation similar to those we have with other bodies is also possible. In summary, exciting things are happening as we engage in ecumenical and inter-Lutheran conversations as part of our ministry and mission!